HURRICANE BEARS DOWN ON US MAINLAND. IS OBAMA TO BLAME? The first major tropical cyclone of the current hurricane season has formed. 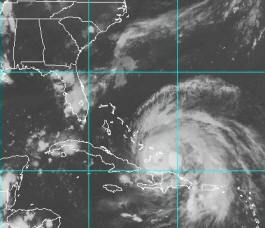 Hurricane Irene is expected to strengthen to a Category 3 by Wednesday, having sustained winds of at least 111 MPH. The path of this storm will take it straight to the US East Coast, most likely to The Carolinas. Is President Obama to blame for this impending catastrophic storm? Many say yes. He is the President, yet he has done nothing about it. Republican Presidential Candidate, Michelle Bachmann says: "As President, I will not be vacationing in Martha's Vineyard when danger lurks, I will pray forcefully to Our Lord and Savior Jesus Christ, and send the storm away. Obama is not doing that because he is a Muslim!" She went on to say that as President, she would definitely not tolerate Muslims, and that foreign heathens in places like The Dominican Republic and Puerto Rico, ruled by that godless tyrant, Fidel Castro had already felt the wrath of The Lord. Texas Governor Rick Perry, who has also thrown his hat into the ring for the 2012 GOP nomination says that this storm is misdirected. "As President, I would pray long and hard to send this storm to Texas, where we are suffering from a drought, not to Carolina or Florida. I would also assure that it would weaken to no more than a tropical storm before coming ashore in the Lone Star State, so it would not cause death and destruction." Across Florida and the eastern seaboard, panicked coastal residents are already hoarding gasoline and groceries in preparation of the storm. Gasoline cans have become virtually unobtainable. "A lot of people here are wondering why President Obama has not acted. These four cans are all I could get! I need more," said frightened resident Buster Franks, a Tea Party activist. 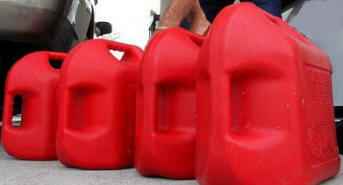 "We will need gas and lots of it after the storm. Why isn't he doing anything? We will also need milk, eggs, bread, guns, bullets and things to survive. The store shelves are empty." He also told me "If this storm turns as ugly as it looks like it will, Obama will have a lot of questions to answer. God is sending us a message. What further proof do we need. There was an earthquake there (in Washington) today."